WOW. This clay was still really really wet (probably too wet to through, really). And really, really messy. I didn't want to wedge the clay (which would have dried it out a bit more) on my canvas boards because my usual clay body is white and I didn't want to risk staining the boards or future projects. My ususal is also really fine-grained; it feels a bit like handling cream cheese (people also describe porcelain clay as feeling this way). This raw clay has a lot of sand incorporated in, so throwing with it felt really different. 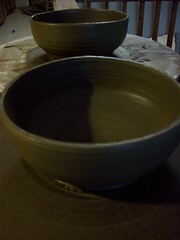 I thew thickly and slowly- but my first few attempts collapsed when I pushed the clay too far. My fingernails got shredded (they were a bit too long for throwing anyway), but thankfully my skin didn't. These two bowls are maybe 8" in diameter and 3" tall. I checked them this morning and they were too wet to trim (but it's been rainy all week, so everything is drying more slowly). I've never used clay this dark- I've used terra cotta before (that is REALLY rough on your skin) and we all know how terra cotta pots look when fired, but I have no idea what will happen with these. I don't know if the color will fire out (most clays change color when fired), or if the clay will even go up to cone 6 (+/-2200 degrees), because some low fire (1800 degrees, not as durable, prone to chipping/flaking) clays will melt at that temperature. I have several more pounds of the clay, so I think I'm going to make several smaller pieces to test with clear glazes at low and high ranges so that I don't inadvertently destroy these two larger pieces. I tell you, I haven't felt this excited about pottery in quite a while. I love what I do, I love my functional pieces and the style I've developed with them, but it is fun to experiment with something that is unpredictable.